Tomas, can you provide us with a little background with yourself? It's always so interesting to see the designers background and what they do for a living, not to mention the global nature of the hobby! I am 41 years old and I live in a small village on the country side in Sweden with my wife and three kids. I work as a software engineer for a company that develops safety systems for cars that help to prevent traffic accidents. I’m somewhat of a gadget geek but my true passion besides RC flight is photography. I also enjoy outdoor life and trekking/hiking. So you have an engineering background! That makes sense. As you know, you have 6 models on Parkjets right now, but I believe your F-22 is by far the most popular download. Your design of the simple thrust vectoring tabs really changed the way a lot of RC planes were designed, you sacrificed some scale for some really unique performance. Can you take us through your design process and some of the inspiration for your models? It all started when I saw a video of someone flying the Ikarus Su-27 on YouTube. The Ikarus model is a simple profile pusher jet that uses tabs and slots to help the builder align the parts. I thought to myself “I can build something like that”. So I began working on the F-22. I chose Google Sketchup for designing my model as it was free and I already had some experience with it. I found some three-view diagrams on the Internet and started outlining the wing and the fuselage. When I finished the outline I put the parts together in space to form the actual aircraft. Then followed the process of creating slots and tabs to help with alignment during assembling. And that is basically the design process I’ve used with all my designs. We have seen lots of designers are using Google Sketch Up. It's a great tool. And we like the "maker" attitude you brought to the table. Many hobbyists have the same experience, we see something and believe we can make it. Okay, out of all your designs, which model do you prefer to fly or which model are you most proud of, you get the idea? I’d say the F-22. 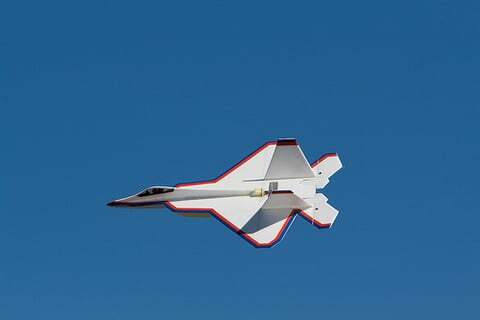 It looks great and has a great flight envelope handling both high and slow speeds really well. The F-22 is one of the favorites in our hanger too. That and your F-18E. 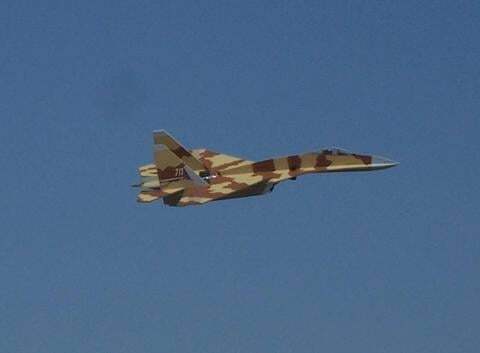 One design we recently added is your SU-31. I have to say it’s a great, simple design that has a lot of versatility. Do you have any advice for those pilots looking to build and fly your SU-31 for the first time? Make sure your servos are glued properly. :-) I crashed mine on one of the first flights when one of the servos came off during a dive. Other than that I don’t have any particular advice for the Su-31. I designed the Su-31 mainly because I wanted a less noisy plane to fly. Most of my other designs are of the “prop-in-the-slot” type, which are really loud. Servo failure. What can we say, it happens. Great tip though. And the SU-31 remains a popular download each month. 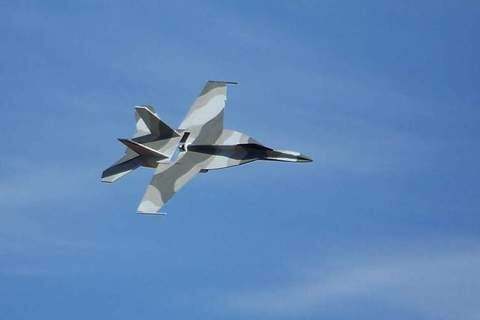 Not including the SU-31, all of your jet designs feature a mid-fuse engine design. What was your primary reason for going with a mid-engine design? It’s mainly about center of gravity. With the engine mid-fuse I can have the electronics farther back. For the F-22 and Mig-29, this means having the electronics inside the main fuselage compartment. The mid-fuse placement of the engine also means that there will be a direct airstream from the propeller over the rear control surfaces which increases the plane’s agility. This is in a way like the thrust vectoring nozzles of the real F-22. The tabs on the elevator increases this effect, at least in theory. Based on performance, we would guess you can put that theory in the "confirmed" catagory. We can tell you that your designs are downloaded from all across the globe and that has to be rewarding to know that your designs are flying in just about every place around the world. What would you say makes your designs appealing to such a large audience? First of all, my plans are free, so that is important. Other than that it’s probably the fact that the depron airframe is cheap to build and often quite easy to repair. And perhaps that my designs can be assembled rather quickly. Also perhaps the fact that at the time when I first published the F-22 and the Mig-29 there weren’t that many good free plans available for pusher profile jets. With a family and work, do you find the time to get out and fly anymore or design anymore? I don’t find the time to design at the moment. I do try to make time to get out and fly now and again. My latest passion is flying DLGs, or discus launched gliders. There’s something special with flying a glider with no motor. Here I am flying the ELF DLG from Vladimir’s Model. Gliding is considered the purest form of flight by many and we know lots of people have modified your F-22 by increasing the wings to turn them into gliders! 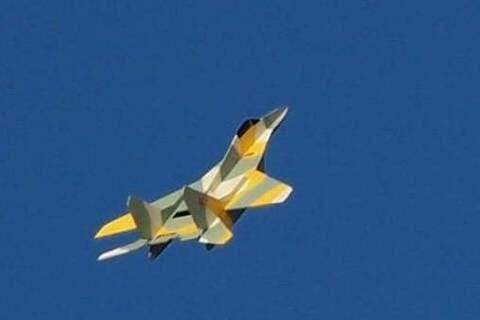 Do you think you will design anymore RC airplanes in the future? I know a lot of people have been inspired by your designs but having you crank out another would certainly be well received in the RC Community. At the moment there are so many other things in my life that I just don’t have the time required for doing new designs. But I’m pretty sure that I’ll get back into designing at some point. I just don’t know when. Well, when you get around to it, Parkjets would love to host it! I'm sure it would be an instant hit. One of the cool modifications we have seen to your designs is that people are using Electric Ducted Fans instead of the propeller and simply mounting it in the same place. Some of these EDF’s are getting pretty good performance because your design is very light weight. Do you have any experience or advice for builders wanting to modify your design for EDF? I’ve been wanting to get into EDFs, but I haven’t gotten around to it yet. So, no, not really. But I’m following the development with interest. EDF's are finally getting good, but we have to admit, we like a good pusher as much as anything. We don't want to take up too much time, is there anything else you want to add? Tips? Advise for new builders? Etc? I’ll leave you with this tip: More or less any design with enough wing surface will fly as long as you get the center of gravity right. It might not have superb handling, but it will fly. So don’t be afraid to experiment. Thank you so much for taking the time to answer our questions Tomas! It was a real pleaure and gives our readers some insight into your designs and your life. We can't thank you enough! That's all folks, if you want to check out Tomas Hellberg's designs right here on Parkjets, you can sort by designer and of course you can visit his website for great pictures, manuals, and of course, you have the opportunity to donate directly to him from Parkjets too. And if you are not wanting to cut out your airframe, visit 6mmFlyRC and get a laser cut kit shipped to your door.